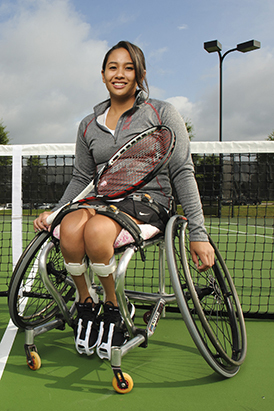 From the October 2016 Desktop News | Shelby Baron was helping unload cars during freshman move-in day at The University of Alabama when she got a call from Team USA wheelchair tennis coach Dan James. It was Aug. 12, her 22nd birthday, so Baron thought James was calling to wish her a happy birthday. Lack of pre-ordered team gear aside, Baron, a communicative disorders major and wheelchair tennis player at UA, learned that day that she’d compete in her first Paralympic Games, which began Sept. 7 in Rio de Janeiro, Brazil. The timing of the news made for a perfect birthday present, but it was also a fitting reward for a summer’s worth of hard work. Baron, of Honolulu, Hawaii, opted to spend her summer on campus, where she took classes and received extra instruction from UA wheelchair tennis coach Evan Enquist. Though the cut-offs for the national team were in May, Baron was keen to improve her game ahead of her senior season at UA. And there was always the chance that the withdrawal of another athlete could open a spot for her, so training throughout the summer could have potentially benefitted her on both fronts. Baron is one of seven current UA players or coaches who competed in Rio. Fifteen former UA student-athletes and coaches also competed. More than 20 current and former players and coaches competed in the 2012 Games in London, including three who medaled. Baron said that when she learned she’d made the U.S. National Team, she called her family in Hawaii, though, with the time difference, it was roughly 4 a.m. in her home state. Her mother answered the phone and was understandably groggy, but they shared a longer, more jubilant phone call later that day. Since then, the congratulatory messages have continued pouring in. Normally, an athlete would receive a hometown send-off before heading to the world’s greatest athletic tournament, but Baron continued to train in Tuscaloosa before flying to Rio Sept. 1. Regardless, three hours and 18 minutes later Baron and her partner went on to win the match two sets to one. Though Baron was later eliminated by the No. 1 seed from the Netherlands, she says she played her heart out with no regrets.